This month's Royal Foodie Joust with its ingredients of fennel, dairy & parsley had me a little stumped at first. Then suddenly I had too many ideas & couldn't decided which way to go. In the end I decided when in doubt comfort food is always the best way to go. Well, as far as I'm concerned you can't get much more comforting than a pot pie. For this pie I made a creamy chicken filling featuring fresh fennel, onion, carrots, peas & mushrooms. Parsley is added at the end of making the sauce to add a little brightness. I also added fennel fronds to the filling to boost the fennel flavor. I love the way the fennel tastes in this, it just adds a nice warmth to the overall flavor. The crust is a basic butter pastry which cooks up wonderfully flaky, just make sure to use cold butter & not overwork it. I let the crust hang over the edge about an inch so that there's lots of extra crust, I like to have a little piece with every bite of filling. Put flour, salt & sugar into a food processor & pulse to blend. Add butter & pulse until it forms a coarse meal texture. Sprinkle 1/4 c cold water on top & pulse until the dough clumps together when pinched. If the dough isn't coming together add more water 1 T at a time. Split the dough into two balls & flatten them into discs. Wrap in plastic wrap & chill for 30 minutes. Split the filling between two single serving ramekins. Roll out each disc of the pastry dough into circles about 1/8-inch thick. Lay the discs over the top of the filling letting it hang over the edge of the ramekins. For a golden crust brush it with a little beaten egg. Make a few slits in the crust with a sharp knife. Place the ramekin on baking sheet & bake for 25 minutes or until the crust is golden brown. Thanks to Jenn the Leftover Queen for hosting another fun month of the Royal Foodie Joust. Fantastic! I can just imagine how those flavours sing. And I am totally with you on the extra pastry! I'm going to have to look at all of these entries to try to get myself to like fennel. I keep saying I'm going to try it again, but last time I did, I still wasn't a huge fan. But This sure does look good! Great entry and beautiful photos. I love recipes for 2! Kat, just saw this in the forum and it's awesome, perfect timing with the cooler temps. You have a shot here at the apron! I openly admit my favorite part of a pot pie is the crust and this crust looks flaky and delicious. Good-lookin' pot pie. Yay! Yummy as per usual! Good luck in the joust! It's just started to get cold here and I've been cracing chicken and flaky pastry a lot. I wouldn't have guessed that crust was home made - it's really quite perfect. 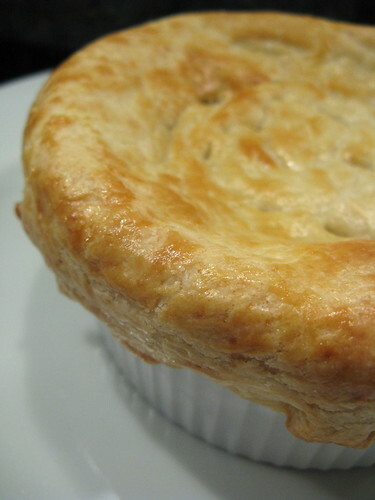 Pot pies have earned their place, that's for sure - it might just be time to fill the freezer with mass quantities. That is one homey, cozy, beautiful pot pie. I need to have that! 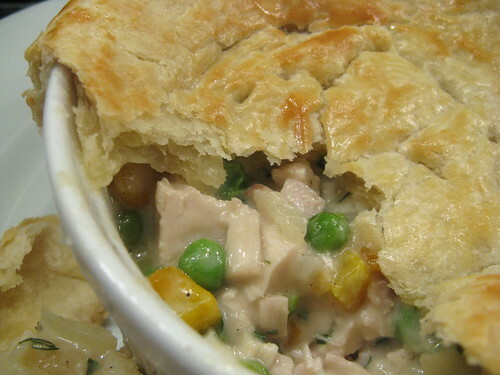 when it comes to chicken pot pie, i could care less what's inside--the crust is the main draw for me. that being said, yours looks absolutely amazing--perfectly flaky and buttery. bravo! This is totally great Kat! 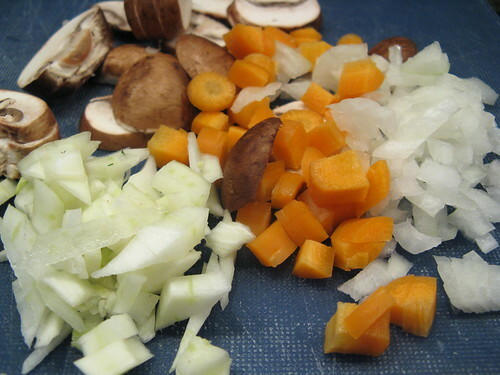 I love all the ingredients and I love how fall-ish this dish is! A big bowl of comfort, indeed! Best of luck!